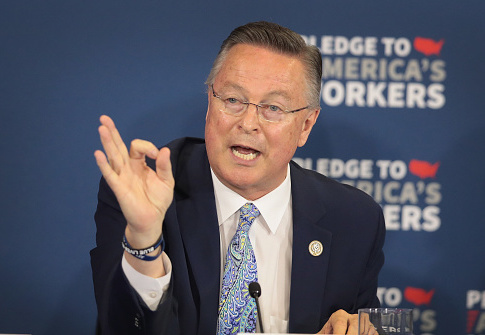 The House election in Iowa's First Congressional District pits Republican congressman Rod Blum against Democrat Abby Finkenauer, a member of the Iowa House of Representatives. The closely contested race will prove crucial for determining which party will control the lower chamber of Congress next year. Covering much of northeastern Iowa, the district has been competitive in recent elections. Former President Barack Obama carried the district twice, but it flipped to President Donald Trump in 2016. Democratic representative Bruce Braley held the seat from 2007 to 2013, before Blum won it in 2014. The district contains three metropolitan areas: Waterloo in Black Hawk County, Dubuque in Dubuque County, and Cedar Rapids in Linn County. These urban centers tend to be more liberal, with Obama carrying all three areas in 2008 and 2012. Trump lost in Black Hawk and Linn by fewer points than Mitt Romney, and he narrowly won Dubuque. The rest of the district tends to be more rural and, at least compared with the urban centers, more conservative in character. Agriculture accounts for much of the economic activity in the district—John Deere has a factory in Waterloo. The avionics industry also has a presence there, with Rockwell Collins headquartered in Cedar Rapids. Democratic voter registration outnumbers Republicans by just over 20,000 people, although Republicans have an edge in a majority of the district's counties. In the three urban centers, there are about 33,000 more registered Democrats than Republicans. The Democrats' overall registration edge in the district has increased by 2,000 since Trump won it in 2016. The economy and jobs are primary concerns for voters in the district. Thomas Hansen, chair of the Winneshiek County Republicans, told the Washington Free Beacon that farmers were at first concerned about the impact of Trump’s tariffs on trade. "But they’ve come to realize that tariffs have been affecting them for the last several decades," Hansen continued, "and what the current administration really wants to do is to get to a point where we can actually have some type of free trade that will be better for farmers." Tim Busch, chair of the Benton County Republicans, is confident that the current state of the economy will help the GOP in the district. "All of the factors are lining up," Busch told the Free Beacon. "It’s pretty difficult to fight from the outside, from the party not in power, against a successful economy." Polling in the district shows the race is close. A recent internal poll by the Blum campaign had the incumbent behind by 2 points with 6 percent undecided. The results were within the poll's 4.9 percent margin of error. A memo sent out by Corry Bliss, executive director of the Congressional Leadership Fund, said a CLF poll showed Blum with a 4-point lead. Bliss noted that "Democrats have struggled to capitalize on significant financial advantages," and said the CLF added $1 million in television and digital spending into the district. Democrats are also leading Republicans in absentee ballot requests. In the district as a whole, just over 39,000 registered Democrats have requested ballots compared with over 27,000 Republicans. About 19,000 unaffiliated voters have also requested ballots. Put in context, however, absentee ballot requests by first district Democrats outnumbered Republicans by almost 23,000 in 2016 and by about 13,000 in 2014, and Blum still won the district both years. Bret Nilles, chair of the Linn County Democrats, told the Free Beacon that Trump is motivating Democrats to vote. "After the election two years ago, we’ve had more people showing up to our central committee meetings than we had before," Nilles said. He also pointed to absentee and early voting as an indication that Democrats want to impact the race. "I think, on our side, Trump's had a motivational impact," Nilles continued. Republican voters are also engaged, and Busch says Supreme Court justice Brett Kavanaugh's contentious confirmation increased conservative enthusiasm. "I think the big blowback on the Dems has been the Kavanaugh hearings," said Busch. "That woke people up and it’s really obvious here…. There's a lot more interest, a lot more discussion, a lot more activity." This entry was posted in Politics and tagged 2018 Election, Iowa. Bookmark the permalink.